If you're considering a smart video speaker for your home, you're faced with three solid choices. How can you determine which is best for you? Here, we'll dissect the features of each device so you can easily make your decision. If you own an Amazon Echo, you'll already have experience with some of its basic functions, such as asking Alexa about the weather or finding out the latest news. The Echo Show's video capabilities provide more details to these classic Echo features and create room for new functions as well. The next time you ask Alexa the weather, the Echo Show can show and tell you what the forecast looks like. You can use the Echo Show to stream your favorite shows and movies from Amazon Prime Video as well. If you don't feel like watching a movie, cue up some music instead. Sync your Echo Show to Amazon Music, Apple Music, Pandora, or Spotify to turn the device into a full-blown speaker. Whether you're an aspiring or expert chef, the Echo Show can help when you're busy in the kitchen. Ask Alexa to pull up a recipe, and the Echo Show will provide you with detailed instructions that you can follow along step-by-step. Right now, the Echo Show only supports recipes from Epicurious, Allrecipes, and Food52. You might already use Amazon Echo's voice commands with Phillips Hue. If you do, you'll be happy to hear that the Echo Show allows you to communicate with your smart lights and then some—you can shut off or turn on electronics, lock or unlock doors, and watch for any intruders with Ring or August. Did I mention that you can use the Echo Show as a way to monitor your pets or baby? Connect the Echo Show to a compatible baby monitor, or simply set up another Echo Show in a different room. Ask Alexa to check on your loved one, and you'll see live video and audio from that room. The 7-inch display still comes with some advantages, like an RBG sensor that automatically adjusts the Home Hub's screen brightness. You can even ask Google any question in your choice of 30 different languages. The Home Hub will then display an answer along with a series of suggested follow-up questions. Google Photos comes with a ton of amazing features on its own, and pairing it with a Home Hub makes it even better. Have your Home Hub display certain photos just by saying something as simple as: "Hey Google, show me pictures of my dog." You can do the same with other pets, locations, events, and more. Use the Home Hub as a photo frame by creating a shared Live Album. Choose certain friends, family members, or pets that you want to appear in your frame, and your Home Hub will display their photos. You don't have to worry about constantly updating your Live Album either—when you or your family take new photos of your best friend or pets, they'll automatically appear on the Home Hub. Unfortunately, the Home Hub falls short in terms of video calling, as it doesn't come with a camera for privacy reasons. The Home Hub still allows you to make video calls through Google Duo, only you won't be seen on camera. As long as your friend has a camera on their device, they'll appear in video-form on your Home Hub. Your friend will just have to get used to the fact that they have to talk to your unmoving profile picture. Google's device also hogs all of YouTube's excitement, as Echo Show users have no access to this app. Play YouTube videos and music completely hands-free. Don't forget that you can stream music through iHeartRadio, Pandora, and Spotify as well. When video calling with the Echo Show, you might find yourself awkwardly tilting the device to capture footage of everyone in the room. Facebook solves this issue by incorporating AI into the Portal's Smart Camera. The next time you make a video call with multiple people in the room, the Portal will automatically adjust the camera to fit everyone in the frame. If there's a ton of background noise where you live, the Portal ensures that your voice can still be heard. The Smart Volume feature silences any competing sounds that interfere with your call. Does a long-distance family member miss seeing your children? Now they can have the same bonding experience as they would in-person with Portal's Story Time. Your family member can read a short story to your little one, while Portal uses augmented reality to add silly effects to their face. While Google completely eliminates a camera from the Home Hub's design to solve the issue of privacy, Facebook provides a practical camera cover. For an increased feeling of security, you can turn the camera and the microphone off as well. A huge downside to the Portal is that it doesn't offer access to any streaming service. You can only watch videos on a limited number of largely unexciting websites, such as CNN, YouTube, and Food Network. The Superframe might sound like some heroic photo feature, but it just barely stacks up to the Live Albums on the Home Hub. When the Portal is idle, it shows the photos and videos you're tagged in from Facebook. It also displays the availability of your contacts, the weather, and birthday reminders. It's hard to choose between the Echo Show, Home Hub, and Portal when they all have similar features. The Echo Show proves to be the most powerful of the three, with its all-around capabilities that the Home Hub and Portal just don't have yet. 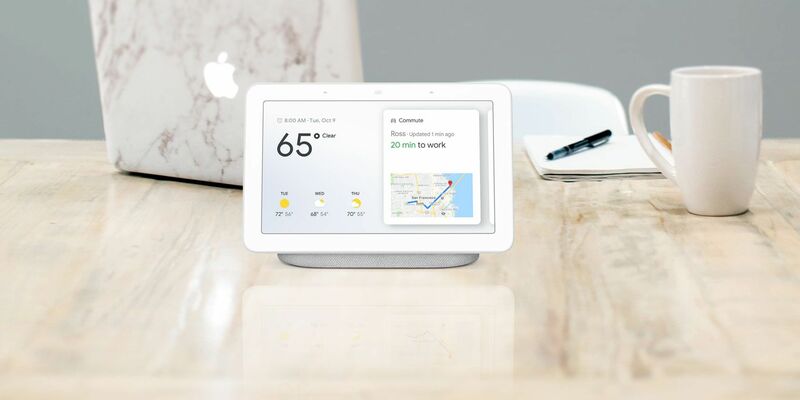 Still, the Portal has many advantages when it comes to video calling, while the Home Hub is still a reliable and less expensive alternative to the Echo Show. Not ready to shell out hundreds of dollars for a video calling device? In that case, save some cash and check out our guide to using WhatsApp for video calling.